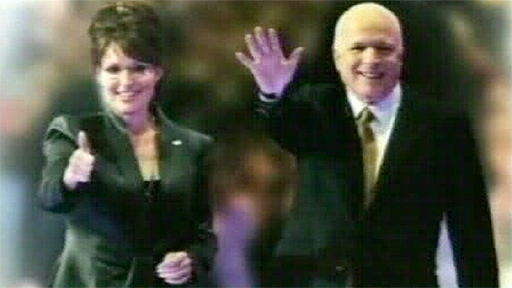 It has been a week since Alaska Governor Sarah Palin was catapulted from relative obscurity to centre stage as US Republican John McCain's choice for running mate. Here are 10 things we now know about her. 1. Her five children are named Track, Bristol, Willow, Piper and, last but not least, Trig Paxson Van Palin. 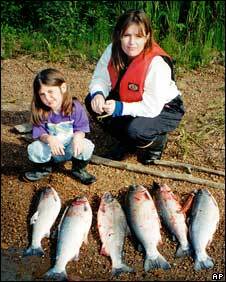 According to the Washington Post newspaper, Track was named after the course of the sockeye salmon the family fishes off the town of Dillingham, while her eldest daughter's name comes from Bristol Bay, an area known for its salmon fisheries. The name Willow relates to the state bird, the willow ptarmigan, and a nearby town, the paper says, while daughter Piper shares her name with the family's small plane. Trig is the Norse word for "brave victory", the Post adds. 2. Her rimless glasses are now a style phenomenon. The titanium Kawasaki 704 frames - designed in Japan, where they sell for $300 - are apparently flying off the shelves. Her upswept hair-do is also reportedly spawning imitators. LA Times fashion writer Booth Moore writes: "The untidiness of her updo has a can-do spirit that says, 'I have more important things to do than worry about my hair, so I just twirled it into this clip so I could get to the real business of governing and shooting caribou and having babies and taking them to hockey practice.'" 3. John McCain picked someone who not only appeals to "Wal-Mart Moms" but is one herself, shopping for the family in a local branch. Not only that, writes New York Times columnist William Kristol, but "he picked someone who, in 1999 as Wasilla mayor, presided over a wedding of two Wal-Mart associates at the local Wal-Mart". 4. Mrs Palin enjoys moose-hunting and salmon-fishing - and has said her favourite dish is moose stew. Former Republican senator and one-time presidential hopeful Fred Thompson described her as "the only nominee in the history of either party who knows how to properly field-dress a moose". Cindy McCain, in her speech to the party's national convention, said her husband John had "picked a reform-minded, hockey-mommin', basketball-shooting, moose-hunting, salmon-fishing, pistol-packing mother-of-five for vice-president". 5. A month before her fifth child, Trig, was due, Mrs Palin's waters broke while she was in Texas to address a conference. She delivered her speech nonetheless and embarked on the long flight back to Alaska - changing planes in Seattle - before travelling an hour by road to hospital to give birth. She says she was not in "active labour" and her doctor said it was fine. Alaska Airlines allows women to travel in the late stages of pregnancy. Husband Todd - a commercial fisherman - is quoted by the Anchorage Daily News as saying: "You can't have a fish picker from Texas." Three days later, Mrs Palin was back at work. 6. As governor of Alaska, Mrs Palin ditched plans for a "bridge to nowhere" - a federally-funded project to link a handful of Alaskans to an airport at a cost of hundreds of millions of dollars. In her speech to the Republican National Convention, she said she had told the US Congress "thanks, but no thanks". But US media say she appeared to support the project while running for governor in 2006, though she said the proposed design was too "grandiose". And when she announced the cancellation of the bridge a year ago - after it gained notoriety as an example of wasteful spending - she hardly seemed to be turning down federal funds out of thrift. She explained the decision by saying, "It's clear that Congress has little interest in spending any more money on a bridge between Ketchikan and Gravina Island." The federal funding was diverted to other projects in Alaska. 7. In a line that has gone down well at the Republican National Convention and on the campaign trail, she boasts of putting the previous governor's "luxury jet" on eBay as a measure to cut wasteful spending. That is true. But what she has not always explained to her audience is that the plane failed to sell on the internet auction site and so aides had to broker a deal with a buyer. 8. She was baptised a Catholic as an infant but attended a Pentecostal church in Wasilla - her hometown since her parents moved to Alaska from Idaho when she was three months old - for many years. She now attends Wasilla Bible Church, a non-denominational, evangelical church. The Associated Press reports that the church is promoting a conference that promises to convert gays into heterosexuals through the power of prayer. 9. As hunters sometimes do, Mrs Palin has incurred the wrath of wildlife-lovers. It's not just that she shoots moose and caribou, she has also backed legislation to encourage the aerial hunting of wolves, as a "predator control" measure. Plus, she has opposed the US government's listing of a variety of animals as endangered, including the polar bear and the beluga whale. Unlike Mr McCain and to the horror of many environmentalists, she actively supports drilling for oil in the Arctic National Wildlife Refuge. 10. She is a self-described "average hockey mom"; a biography published a few months ago was entitled Sarah: How a Hockey Mom Turned Alaska's Political Establishment on Its Ear. The hockey mom branding could prove useful come November in the swing states of Michigan and Minnesota, where ice hockey is a big game. Her best-known joke so far? "What's the difference between a hockey mom and a pit bull? Lipstick."